Over the last few years, Brazil has been thrust onto the global stage like never before. Years of strong growth during the early 2000s made the country a darling among investors in emerging markets and earned it a distinguished spot within the group of BRIC countries. Just as economic growth was cooling, a successful, if controversial, execution of the 2014 World Cup and 2016 Summer Olympics again turned the spotlight on Brazil. More recently, headlines about corruption and political instability have ensured that Brazil has stayed top of mind. Those of us interested in agriculture are well aware that Brazil is one of the breadbaskets of the world and is a dominant player among the world’s agricultural economies. But just how big is it? And to what extent does Brazil contribute to global food and fiber production? Today’s blog will explore these questions in an attempt to gain a clearer understanding of this Latin American behemoth. In 2016, Brazil’s GDP was estimated at nearly $3.1 trillion USD. While this is only about one sixth of the United States’ GDP, it is large enough to make Brazil the eighth largest global economy, and the clear leader within Latin America, according to the CIA World Factbook. Mexico is the next largest regional player with a GDP of $2.3 trillion USD, ranking twelfth in the world. 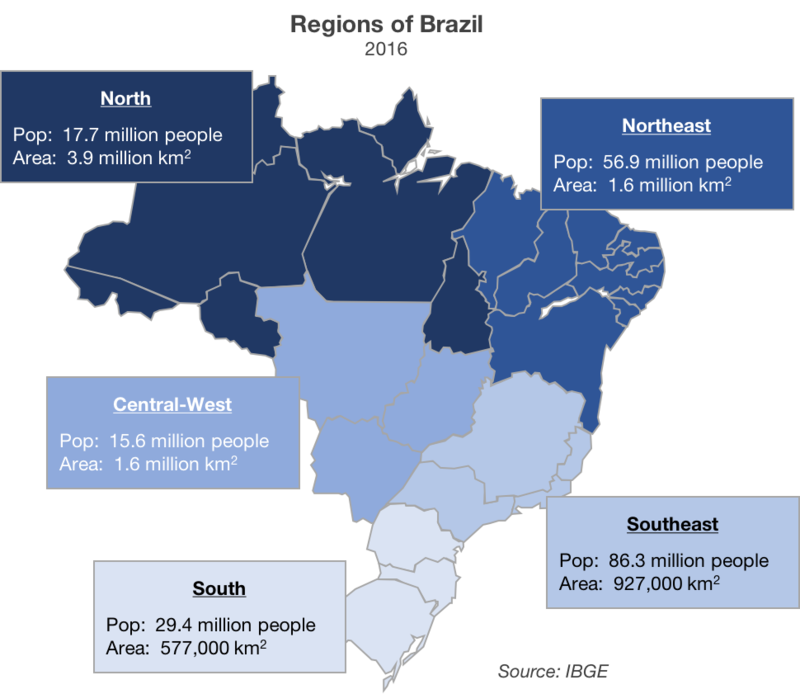 With a population of 211 million people, and covering an area of 8.5 million square kilometers, Brazil accounts for almost half of South America’s population and landmass. Agriculture has shaped Brazil’s history as the country’s economy and demography have grown and shifted with the rise of rubber, coffee, sugar, and other agricultural products. Today, while agriculture only contributes an estimated 5.2% of GDP, the sector is disproportionately represented in other economic indicators. Agriculture accounts for 10% of the labor force and has over indexed in productivity growth over the last several decades. Perhaps even more prominent, the FAO reports that in 2013, agricultural products were responsible for a full 36% of Brazil’s exports. About one third of Brazil’s area is dedicated to agriculture, with pasture land accounting for the vast majority of this share. As of Brazil’s last agricultural census, conducted in 2006, the country had 5.2 million farming units. As is the case in many agricultural economies, there is a broad range in the size of these units, with larger, more professional farms dominating production in Brazil. According to the same census figures, farms of over 1,000 hectares accounted for only 1% of farm establishments, but covered about 44% of Brazil’s farmland. North – Brazil’s northern region is comprised of seven states along the country’s northern border. Though it is the largest region in terms of land area, it is one of the least populated given that it is dominated by the Amazon rainforest. According to the WWF, “the Amazon encompass[es] the single largest tropical rainforest in the world [and] it houses at least 10% of the world’s known biodiversity.” As a result, agricultural producers in the region face specific challenges related to sustainability and environmental concerns. For many years Brazil’s North region contributed to the country’s rubber production, but this industry has more recently been replaced by fruit and nut production. Northeast – The Northeast region, including nine states along Brazil’s northern coast, has a hot climate subject to dramatic variability, and sometimes suffers from drought conditions. This region was the first discovered by the Portuguese and is known for its production of cocoa, bananas, cassava, and rice. Central-West – Brazil’s Central-West region has emerged as the hub of traditional agriculture in the country, with production of row crops and livestock increasing dramatically in recent years. This region includes Brazil’s famous ‘Cerrado’. In terms of population, the Central-West is the smallest region and weather varies between tropical and temperate, depending on the specific location. Southeast – The Southeast is Brazil’s largest region in terms of population as it includes the major metropolitan centers of Sao Paulo and Rio de Janeiro. While the Southeast has traditionally been the major agricultural region, increased pressure from urbanization and improved infrastructure in other states have been slowing the region’s relative growth. The Southeast benefits from a temperate climate which supports the production of coffee, sugarcane, and fruits. Proximity to population centers and ports has also facilitated the growth of the agricultural processing industry throughout the Southeast. South – Composed of Brazil’s three southernmost states, the South region has a relatively mild climate favorable for the production of poultry, rice, and tobacco. The region is also known for its livestock production, including dairy, as well as some row crops. It is clear that Brazil offers a broad variety of agricultural products. So how does it stack up against the global competition? The USDA estimates that Brazil will produce 114 million metric tons of soybeans during the year, making it the second largest global producer, just 2.8% behind the United States. In addition, 97 million metric tons of corn production give it the third-place spot behind the US and China, which will respectively produce roughly 385 and 220 million metric tons of this important crop this year. But Brazil achieves global leadership outside of traditional row crops, as well. Brazil is the world’s leading orange juice producer, expected to produce 1.2 million metric tons this year – nearly 3.5 times more than their closest competitor, the US. They are also the world leader in sugar cane production, which beyond human consumption purposes is contributing to a burgeoning ethanol sector. The country is also the leading coffee producer, with production estimated at over 56 million 60 kg bags during the 2016/2017 marketing year – over twice that of Vietnam and nearly four times greater than that of Colombia. Of course, the livestock sector has risen to prominence as well, with Brazil’s poultry sector outpacing that of China and the European Union. In 2016, broiler production in the country was estimated at 12.9 million metric tons, second only to the United States’ production of 18.3 million metric tons. A similar scenario existed in the case of veal and beef. At 9.3 million metric tons CWE, Brazil’s production trailed only that of the US, with a production of 11.5 million metric tons. While recent scandals have damaged the reputation of this sector, there is no doubt Brazilian meat has international prestige. What is perhaps even more telling than the scope of Brazil’s agricultural production, is the extent to which it dominates global trade. Despite having a large population, with a growing middle class, many of Brazil’s agricultural products are shipped abroad. Fueled by growing Asian demand, Brazil’s agricultural exports have grown steadily, with the FAO estimating that the sector boasted a trade surplus of $78.6 billion USD in 2013. Overall, data from the WTO indicates that Brazil is the world’s second largest agricultural exporter, behind the United States, accounting for approximately 9% of global agricultural trade. This dominance is demonstrated across several products. For example, despite not being the leading global producer, Brazil is the world’s leading exporter of soybeans and poultry. Unsurprisingly, the country was also the leading exporter of coffee, sugarcane, and orange juice during the most recent marketing year. Despite only contributing a modest portion of GDP, Brazil’s agriculture has given the relatively protectionist economy important exposure to global markets, generating earnings in foreign currency. As a result, agriculture has played a crucial role in helping to stabilize Brazil through periods of economic turmoil. In fact, on several occasions including the 2008 financial crisis and the more recent recession, economists have credited strong agricultural production with helping to mitigate the impacts of these events, softening the blow to Brazil’s economy. Of course, Brazil has some important challenges to overcome with respect to agricultural production and trade. The country has long been criticized for some environmental practices and human rights violations which will need to be thoughtfully addressed. In addition, while productivity has improved in recent years, it remains far behind its potential. As the availability of arable land runs up against its limits, farmers will need to implement technologies and strategies that help them get more out of the land they already have. In addition, while Brazil has traditionally used protectionist trade policies to shelter local industries, an increasingly globalized world will likely demand a different approach. While these are difficult issues to face, Brazil’s agriculture sector has a track record of rising to the occasion. Time and again, Brazil has proven that it can be the world’s buffet, with an undeniable strength and diversity of agricultural production, truly benefitting the world’s consumers.